STREAM STATION is a compact USB audio interface that goes anywhere and makes it easy to produce great sounding webcasts without cluttering up your desk. For gaming, podcasting, or live musical performances, STREAM STATION has a variety of inputs for voice and instruments and has easy-to-reach controls with indicator lights to keep in you in command. With built-in vocal and instrument effects, automatic level control, and on-board mastering, STREAM STATION has everything you need for unique and professional sounding productions. Simply connect STREAM STATION to your gaming computer and plug in your headset for great-sounding game audio and crystal clear voice chat. Dedicated, easy to reach knobs for mic and output volume as well as an auto-level function ensure clear, even sound and quick, easy adjustment letting you concentrate on gaming. You can even apply effects to make your voice clearer, use reverb to create space, or use pitch and formant shifting to transform your voice into an entirely different person - or something completely out of this world. Not only is it great for multiplayer gaming, but also for video calls and conferences. The balanced XLR mic input and suite of built-in effects make STREAM STATION excellent for audio commentary, podcasts and more. The one-touch loopback function instantly mixes your voice with your computer’s audio, and there’s built-in EQ, reverb and even pitch shifting and formant effects to tailor your voice precisely how you want. Create vocal sounds for a variety of different productions and scenarios. The auto-level function keeps broadcast levels under control while you concentrate on speaking. And the “ON AIR” button with its big, clear indicator light makes it easy to see when you’re broadcasting or to quickly mute everything if the situation calls for it. For singers, guitarists or other musical performers, STREAM STATION is perfect for creating quality webcasts with or without backing tracks. High-impedance guitar connection and XLR mic input with phantom power ensure great sound and proper levels and have easy-to-reach dedicated controls. 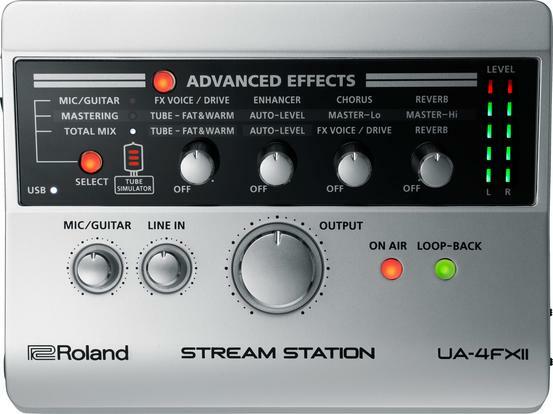 Apply high-quality effects for instruments or voice. Amp simulators provide authentic guitar tones and vocal effects enhance and add spaciousness and clarity to your voice. Stream musical performances or mix them together with other audio or video on your PC using the one-touch loopback function.